As you would expect from a family of many different species covering such a large geographical area these frogs come in many different sizes and from varying habitats (from lowland scrub and forest to high altitude forests). This variation in size (from thumbnail species of 1cm or less to large species of up to 6cm) will determine the type of feeder insects you use with your dart frogs. 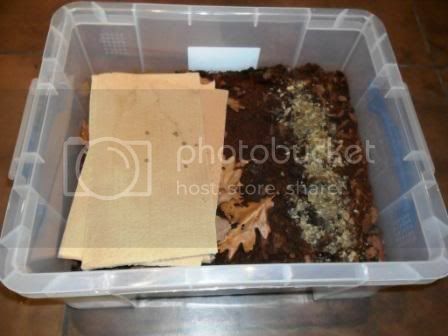 I have included here a number of easily available and easily cultured feeder insects suitable for dart frogs. So often the food of choice for use with larger amphibians and reptiles crickets can be used as a food for dart frogs as well. The two most commonly available species are the tropical house cricket (Gryllodes sigallutus) and the black field cricket (Gryllus sp.). For dart frog use, the size of cricket used obviously depends on the size and habits of the species kept but generally speaking hatchling and 1st instar crickets are used. These can be bought from livefood suppliers or you can breed them yourself. 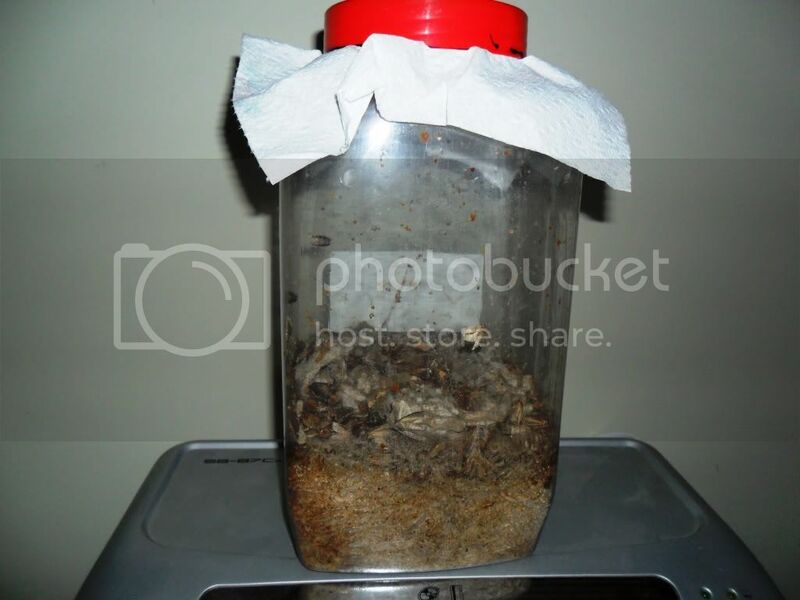 I myself have never bred crickets for livefood use but you will find a guide on most forums. Crickets do have the advantage over some other feeder insects that they can be gut loaded so providing maximum nutritional content for your frog. There are however disadvantages to their use, and some owners of dart frogs do not use them at all. Small crickets and particularly hatchlings are extremely prone to drowning even in small volumes of water and so may not be suitable for heavily misted vivaria. Crickets can eat vegetation, bite frogs and there have been anecdotal reports of crickets being a vector for parisitic worms in frogs. That being said crickets are used by a number of dart frog keepers as their primary feeder insect. 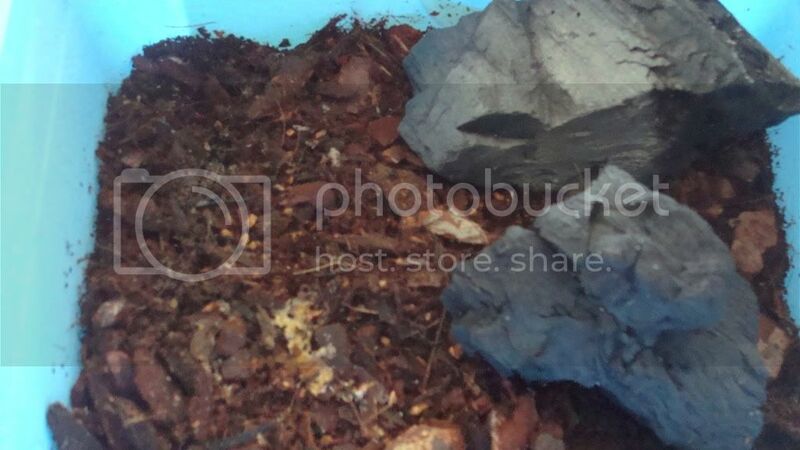 By far the most popular feeder insect in dart frog husbandry, they are easy to breed at home and a number of species are available depending on your own preference. The two most commonly used species are differentiated by their size, namely the small fruit fly (D. melanogaster) and the giant fruit fly (D. hydei) and the decision to use one or other is based mainly on the size of your dart frog. D. melanogaster can also be found in many forms, including vestigal winged, wingless and glider varieties. Firstly you need a suitable culturing container. Culture pots specifically designed for fruit fly culturing can be bought from livefood suppliers, but they can just as easily be cultured in glass or plastic pint cups with tights or net curtain securely attched over the top with elastic bands. The container must be adequately ventilated to prevent stagnation and mould formation. I also add 5 tablespoons of vinegar which I have found to reduce mould formation (although you can buy Nigapin which is a mould inhibitor) as well as vitamin drops or multivitamin powder. Place this in your container to a depth of about 3-5cm (depending on size of your culture pot). Next you need a suitable material to place on top of the culture medium which will provide structure for the maggots to pupate on, raffia or wood wool is perfect for this and is easily available. Corrugated cardboard can also be used but has a tendency to collapse when in contact with the moisture from the culture medium. After letting your culture medium ferment slightly (normally about a day) you can add your flies from your starter culture. I add at least 100 flies but usually more, if you do not add enough you will not have enough maggots produced to work through the medium and prevent bacterial and fungal overgrowth, resulting in a poor or crashed cultures. Keep your cultures at around room temperature. Any higher may lead to drying out of the medium. The first generation of melanogaster will appear after 7-10 days and hydei slightly longer (14-18 days). A feature of D.hydei is that the male flies take about week in order to become fertile so either use a mix of old and new flies to seed a new culture or wait until after the first flush of flies. Drosophila funebris - a species slightly smaller than D.hydei and noticeable by their bright red eyes. Culture as D.hydei. Drosophila mulleri - a wingless species slightly larger than D. melanogaster resembling an ant more than a fly. Culture as D. melanogaster. Drosophila buzzatti - a vestigal winged fly (so flightless) cultured as D. melanogaster but slightly larger in size. One disadvantage of fruit flies is that cultures can crash for apparantly no reason and so it is always wise to have more cultures than your anticipated need. Another is that unlike crickets you are unable to gut load them prior to feeding to your frogs. Mites represent the biggest problem associated with fruit fly culture. They compete for food with the flies/larvae and some mites actively harm the insects themselves. Keeping cultures on mite paper or in shallow pans of water can prevent spread between cultures. Often mites arrive in starter cultures or from older cultures and dusting your flies prior to seeding a new culture can prevent spread this way. Some evidence has shown mites can be reduced by misting your cultures. On every forum dedicated to dart frogs you will find many many discussions about reducing or eliminating mites in cultures. Springtails are hexapods frequently found in soil, leaf litter and other decaying material where they eat detritus and microbes. They are found worldwide in temperate and tropical areas and a number of species are used in dart frog husbandry as both feeder insects (especially useful for newly morphed froglets too small to take fruit flies) and as tank custodians to dispose of rotting material, mould and debris. 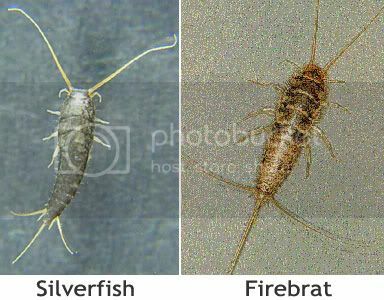 Tropical springtails (e.g. Seira sp.) preferring temperatures around 25C or above. Common white springtail (Folsomia candida) thriving at room temperature or above. European black springtail (Tomocerus longicornus) thriving at room temperature. They are easily cultured and require little attention. You need an unventilated container ( I find empty 2L empty ice cream tubs ideal) and a base mixture of half coco fibre and half coarse orchid bark (you can buy ready made culturing media) and a starter culture. Once the starter culture has been added this media needs to be kept moist but not wet, misting every couple of days is fine but allowing the media to dry out will kill the culture. A few weeks after starting your culture you are likely to have an explosion in numbers of springtails. After this boom in population I strongly recommend splitting the culture as I have found that cultures remain more viable with splitting after booms and with addition of fresh medium. 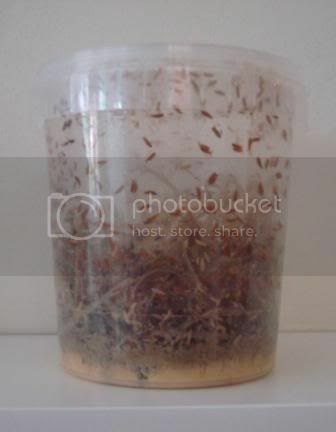 Feed the springtails on small amounts of vegetable matter, fine porridge oats (with added vitamin powder) and also tropical fish flake.The food material may mould in the container but usually this is of no consequence as the springtails will feed on the mould anyway. Most springtail species do well on the foods mentioned above - the only exception is the temperate blue springtail (Podura sp. ), a tiny species excellent for newly morphed thumbnail dart species and mantellas, who I have found do better on a mixture of fish flake and sliced mushrooms. I also place lumpwood charcoal on top of the media - springtails will gather on this and you simply tap them off the charcoal into your vivaria. Premixed springtail food is available from many suppliers. Also known as the cowpea weevil or bruchid beetle these weevils are a useful and easily cultured feeder insect around 4mm in size and useful for feeding to larger dart frogs such as Dendrobates tinctorius and Phyllobates sp. They make a good back up in the event of a fruit fly culture crash. They are devilishly easy to cultivate. First you need a ventilated container and some dried black eyed beans. The adult weevils are nectar feeders but the developing larvae feed on the beans. Fill your container with 2cm of beans from your starter culture and on top add 2cm of fresh dried beans. On top add any adults from your starter culture. Place the container in a warm place (25-30C) such as an airing cupboard. The adults emerging from the beans lay their eggs on the beans and container walls and within 2 or 3 weeks you should have a new generation of beetles but this will take much longer at cooler temperatures, if at all. 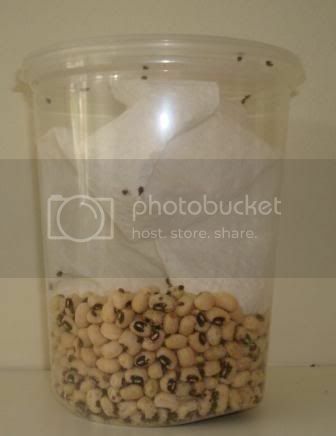 A piece of kitchen paper placed in the culture pot makes it easier to extract the weevils for dusting and feeding to your frogs. Warning: These weevils can fly! These are smaller than the bean weevil and are suitable for smaller dart frogs. Their culture is the same as that of the bean weevil but with grains such as wheat or pearl barley. Most amphibian and reptile keepers are familair with the greater waxmoth larvae but these are generally too big for dart frogs. the larvae of the lesser waxmoth are much smaller (10 - 20mm) and make a nice treat for larger darts such as D. tinctorius. The culture of both waxworm species is the same however. First you need a suitable container - I use the large plastic containers used in sweet shops to hold sweets. In the plastic lid cut out a ventilation hole and on this glue some very fine wire mesh (the larvae can easily chew through most things - including clothes!). In this place a mixture of porridge oats, wheatgerm and wheatbran (in proprtion 1:1:1) and then enough honey and glycerine (usually found in the baking section of supermarkets) until you get a relatively dry cumbley consistency. Some people advocate the addition of beeswax to new cultures but i have never done this (in the wild both forms of waxmoth are major pests of beehives). Add this mixture to the culture vessel to a depth of about 8-10cm and on top of this add your starter culture. Place a crumpled piece of kitchen paper on top of this to provide an increased surface area on which the lavae can pupate. Keep your culture in a warm, dark place and after a few weeks you should have a culture teeming with larvae. You can use any excess larvae or adult moths to start new cultures and by using an amount of your original culture medium you will also tranfer eggs to boost your culture too. Regular splitting of cultures helps prevent mould formation in the medium which can result from the heat and moisture produced from large numbers of larvae. 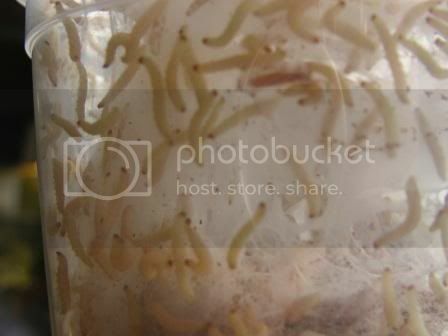 When feeding these to your frogs place in a lipped feeding bowl (such as that used with mealworms) as if placed directly in your vivarium these larvae will just burrow into the substrate. These larvae are high in fat and so are not recommended for regular use but are good as a treat and in aiding weight gain in thin frogs. Please note that these larvae can cause damage to clothes if allowed to escape and breed in your house! Woodlice can be cultured as a food but also make great tank custodians, consuming waste and mould. Tropical and temperate species are available although the tropical species tend to be smaller and more suitable for feeding dart frogs. Popular woodlice species include the dwarf white tropical woodlouse (Trichorhina tomentosa) which is a good all-rounder as a feeder isopod as well as a tank custodian, and the common rough woodlouse (Porcellio scaber) which is an excellent custodian, although the adults are too large and hard shelled to use as a feeder, although the softer shelled juveniles will be taken by larger dartfrogs. 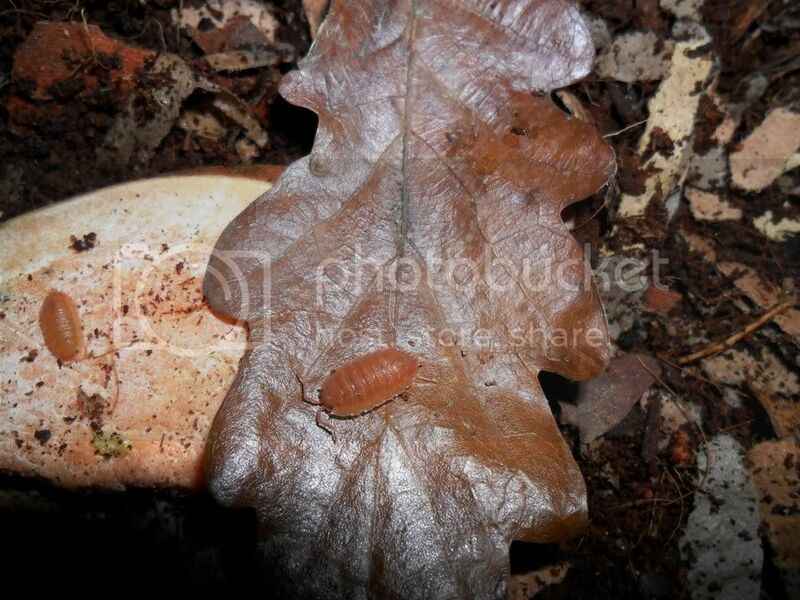 An attractive orange morph of the rough woodlouse, originally from Spain, is also now available widely. They are cultured in a similar vessel to the springtails with the addition of ventilation holes. They are raised on a similar medium but with the addition of dead leaves on the surface. Place pieces of cork bark or pieces of corrugated cardboard (without print) in the container to act as hides and feed on vegetable peelings, porridge oats and tropical fish flake (although again commercial food mixes are available). 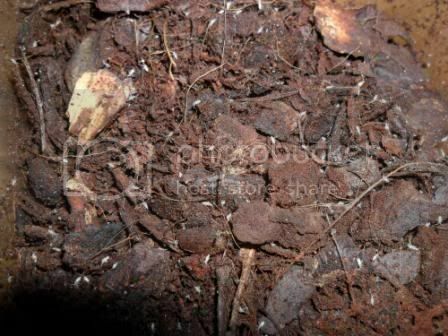 Place culture in a warm dark place and mist regularly (like springtails cultures they will not thrive in dry conditions) however the woodlice will not tolerate wet conditions. A good tip is to only heavily mist on one end of the container - this creates a moisture gradient across the culture allowing the isopds to regulate themselves. Cultures may take a while to establish (normally 2 - 3 months) but once they do, will produce large numbers of woodlice which will be relished by your dart frogs or make useful vivarium custodians. Woodlice will congregate on the underside of bark pieces or cardboard so these can simply be tapped off into your vivaria or brushed off with a fine paintbrush. These are not as widely cultured as other dart frog foods but make an good alternative. They need dry conditions with temperatures around 35C to breed. 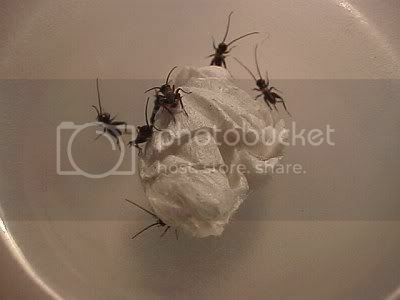 Place in a suitable container (a plastic tub with tight fitting lid with ventilation holes) with a base of egg crates and kitchen paper with slightly damp cotton wool balls on which the females lay their eggs. Add your starter culture and feed on tropical fish flakes. The culture may take a while to establish as maturity takes a few months to achieve but the culture will boom after this if breeding temperatures are maintained. Confused Flour Beetles (Tribolium confusum) are cultured for their small (~4mm) larvae which will be taken by many medium and larger dart frog species. Cultured on a dry mix of flour and yeast with a small amount of vegetable matter for moisture. Larvae are obtained by sieving the culture medium but caution must be taken as these have been associated with allergies and those with existing asthma or allergies are best avoiding them as lots of other alternative feeders are available. Aphids and blackfly can be used from the garden but obviously only harvest from non toxic palnt species and in areas free from insecticides or pesticides. They can also be cultured easily - the most commonly used being the pea aphid (Acyrthosiphon pisum). These can simply be raised on pea shoots in ventilated containers. When culturing these rapidly reproducing aphids it is important to have a continuous supply of growing pea shoots and so it is better to get into the habit of regularly germinating seeds ready for when you need to split your existing cultures. Milkweed bugs (Oncopeltus fasciatus) are an easily bred alternative to crickets and fruit flies (I have included a guide to their culture in the feeder section).